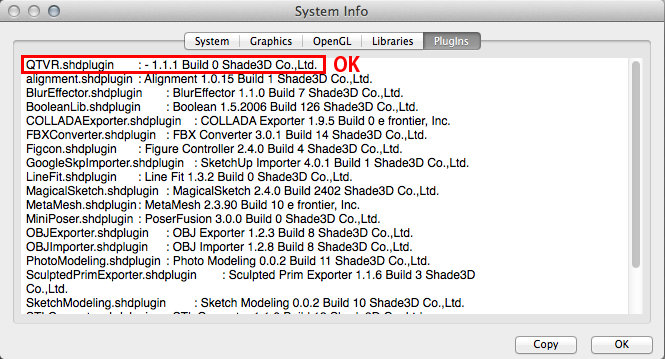 In Shade 3D ver.14.1.3 (Mac OS X version), when selecting in the "File" menu "Export>QTVR Object.." as the file output, the following error message appears: "basic_string :: _ S_construct NULL not valid". QTVR Object export fails with the message "basic_string::_S_construct NULL not valid" after rendering. - This update is only for the Mac OS X version (including the hybrid version), the Windows users do not need to update. - This update is only for the ver.14.1.3, if you are using a previous version of Shade 3D, you do not need to update. Download "QTVR.shdplugin.zip" from the link below, then unzip it to extract "QTVR.shdplugin". *According to its settings, Safari automatically unzip downloaded archive for you. 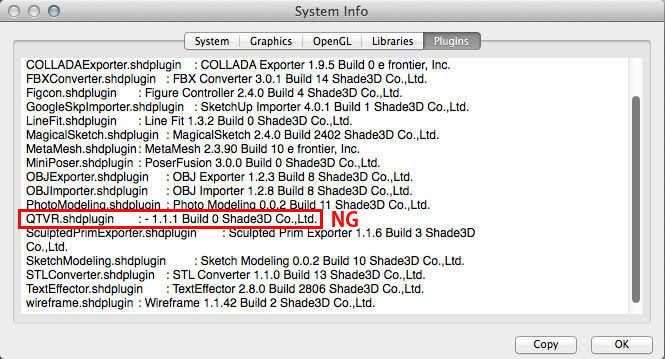 Deploy it into the folder "Shade 3D ver.14/plugins" folder in Documents. Relaunch Shade 3D ver.14 and open Shade's System Info dialog from Help menu. If QTVR.shdplugin is displayed in the upper part of the plugin lists of Plugin tab, Installation is successful. If QTVR.shdplugin is listed downward in alphabetical order. updated plugin has failed to override the old. *Version number can't help to tell which plugin is active, as both give 1.1.1.